Did you remove your preheader and footer blocks from your Modern Editor email design? Learn how to add your preheader or footer blocks back to your design in this support article. Preheader blocks are included in all WordFly starter emails as you begin your email design in Modern Editor. You may have removed your preheader block by deleting it. Once deleted it is removed from the email design. 2. Click on the HTML tab from the lower left corner. 3. Scroll to the <body> tag in the code (directly after the </head> tag). 4. Paste the following code directly after the <div id="email-container" data-wfeviltwin="align: center; width: 600px"> tag. 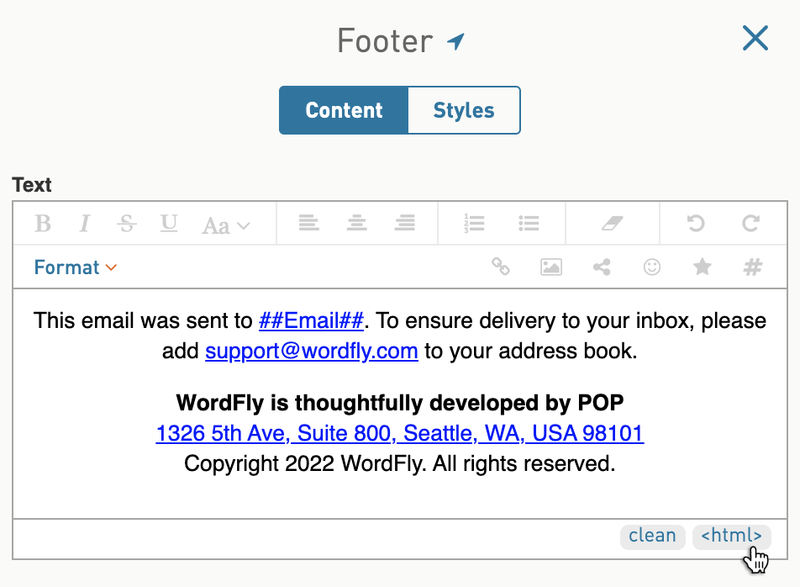 Footer blocks are included in all WordFly starter emails as you begin your email design in Modern Editor. You may have removed your footer block by deleting it. Once deleted it is removed from the email design. 3. Scroll to the closing </body></html> tag in the HTML (towards the end of the HTML). 4. Paste the following code directly above the </body></html> tag.